Ah the Spanish Grand Prix, home to a very vocal and excited crowd -- they come out in their droves to support Fernando Alonso -- and a track that, despite constant revisions, remains one rife with history, respect and renown. It’s also infamous for its challenging corners, undulations and extremely long straight -- perfect for putting the hammer down and showing just how fast these wonderful Formula 1 machines can go. I enter this weekend optimistic after the previous two Asian rounds, curious as to whether my apparent progress will continue as well as what it will be like to drive around a circuit I’m familiar with but suspect will be different in an F1 car (at least, initially). I don’t expect much from it however, as I’m still new and with that inexperience, anything can happen. Aside from misjudging the speed of turn 9 as I went around for my in lap, the first run (on Prime tires) at Catalunya was flawless, a really nice way to start the weekend. My familiarity with the circuit made it easy to learn -- or to put it another way, get comfortable with -- and now that I have experienced it in my Virgin F1 car, I can compare it to Australia’s Albert Park thanks to its fast, sweeping turns; there’s more hairpins and tighter turns here, however. 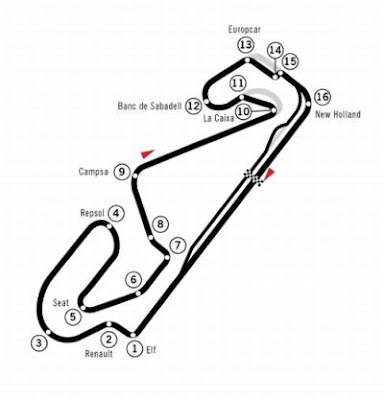 The track is also surprisingly bumpy, a lot of them not noticeable in other vehicles such as, say, the sports cars that I raced around here earlier in my career. 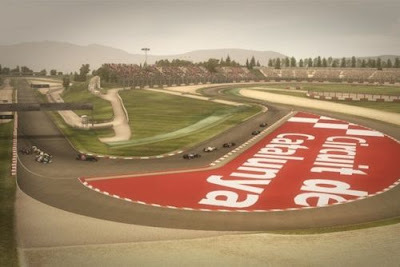 Turns 13 and 16 in particular stand out in this regard, making the final turn tricky and deceptive because you want to be at maximum throttle as soon as possible but might not be able to if the bumps send you off line a bit or, worse, get the wheels spinning. My second run (Primes) was quiet with few of my opponents going out, and only me setting a time early in the session. I unfortunately caught the curb of turn 15 on my out lap, half-spinning in the process (and almost entering the pit lane unintentionally). No dramas but it did, as you’d expect, affect my first flying lap of the run so that was a shame. My second lap was better, lowering my lap time by a nice (early) margin. Nico Hulkenburg came out as I began my third lap and decided to gun it straight away, meaning he was on my tail the entire lap. It was unsettling I must admit. Surprised he didn’t back off. Thanks to my slipstream he passed me going down the straight as he commenced his first lap and I began my fourth, while someone else came out right in front of us. Since they were arguing for track position I aborted my lap and came in early. The track was getting a bit busier at this point, as the others decided to finally begin their sessions. I decided to delay my third run (still on Primes) for a bit with practically everyone else out on the circuit at the same time, going out with just under an hour left on the clock. It was average, my first lap seeing me go wide and missing the apex of turn 1, then nearby on my second lap I rode the curbing of turn 2 too long, causing another half-spin. I also went wide on my third lap in turn 5’s hairpin, then again at the same corner on the next lap I turned in too early (in an attempt to not make the same mistake, perhaps? ), dipping my tire over the curb which was deemed to be corner cutting, resulting in a warning. My fourth run (Primes) was perfectly timed as the track was empty, giving me the opportunity to go out with no distractions. This resulted in a better run, my second lap being my quickest of the weekend yet but my first and third ones seeing me go wide in some corners, so I elected to end it early and come in for a change of setup. Now with lower downforce and a bit more oversteer in the car, my fifth run (Primes) was mixed, the setup improving the car but I couldn’t take advantage of it. I missed apexes on my first lap so that was a dud, and then Hamilton passed me in the second because he was on Options. This actually slowed me down a little, a shame because my lap was on track for improvement. I also had a spin on my third lap after catching one of the bumps in turn 13 which sent me wide and caused me to bounce off turn 14’s curb. The lap ruined, I came in. In search for more grip, I switched to a second set of Prime tires. There was a yellow flag on my first flying lap of the sixth run, in turn 8, so I backed off and cruised around to prepare for the next lap. This paid off as it was great and I improved my time yet again. The positivity didn’t last long, however, my third lap seeing a visit to the wall and the loss of my front wing after catching too much of the exit curb in turn 4 and throwing the car into a spin. After losing some time in the pits as the team repaired the damage, I decided to try the Option tires for my seventh run, though this was abandoned after another spin on my first lap in turn 15. My eighth run wasn’t crash hot either, my first lap hampered by a dip in the gravel of turn 7 during my first lap, though this was soon forgotten as my second lap was much better. Quite ironic too as Jenson Button was on my tail the entire time and, unlike earlier in the day, it wasn’t unsettling. Another wide turn 7 on the third lap saw it aborted and an early return to the pits. Because of this unscheduled visit I elected to go out for a final, 1-lap dash before the session ended which proved to be successful as I set my best lap of the session. I only just got over the line with five seconds left on the clock, which was quite lucky. The lap resulted in 13th for the session with a 1:25.085, not bad given the mediocre and inconsistent session overall. I made far too many mistakes, had a lackluster amount of track time as a result and definitely felt like a novice out there, particularly given my familiarity with the circuit. Catalunya is a tricky but fast track and it will take some time to learn the intricacies of driving around it in the F1 car -- I’m there or thereabouts, but improvement is definitely necessary if I’m to have another decent round. I wasted no time with my first run, going out immediately (and on Options) right behind my Virgin teammate Lucas Di Grassi. My first lap was good, second aborted because of a messy exit out of turn 2 (which impacted upon my entry into turn 3) and my third was business as usual until the exit curb of turn 15 spun me around, so I went straight into the pits since they were right there. Already slightly frustrated with my relatively average start to the session, I was even more annoyed when I realised my Options -- which were the same ones from P1 -- were worn and my team informed me that I had to stick with them because, for whatever reason, they couldn’t track down my allocated sets of Primes. This made me wish the overcast weather -- despite a zero per cent chance -- would result in rain so I could still get some decent track time. The track was also significantly busy, perhaps in case weather did eventuate. My second run (on worn Options) featured a lock up at turn 14, the downhill approach sending me off as a I dealt with it, then a wide turn 9 on the second lap, rendering it a dud. Laps three and four were better, however, and I banked a nice enough time despite the worn tires. My in lap was a struggle though as I had to drive slowly in order to make it back to the pits as I was low on fuel. Closing in on the pits, Bruno Senna came up behind me in the turn 13-15 complex, hesitating to pass (I left room) and clipping the right of his front wing on my rear-right wheel, which I thought was a bit silly. He had to pit afterwards so, naturally, I followed him in (remembering that I was slow because of my fuel situation). My third run, still on the worn Options, was fine though I made no improvements in regards to lap time. I did go wide twice in turn 10, on my initial two laps, but it didn’t hurt my progress too much. The clouds clearing a bit and the sun shining through, it was becoming clear by this point that I wasn’t going to get much track time for this session. My fourth and final run, still on the worn Options, was spoiled by Kovalainen who came out of the pits as I was starting my first lap and affecting it (unintentionally) immediately. After cruising around to begin my next lap, it didn’t last long thanks to my engine giving way between turns 10 and 11, forcing me to retire from the session. Probably convenient (in hindsight) given the tire situation but still annoying all the same, my season’s allocation of eight engines now one less and down to seven remaining. A pitiful seven laps completed for P2 resulted in 19th for the session with a 1:25.895, the best I could manage under regrettable circumstances -- at least I seem to have improved a little, though. According to my engineer, Lucas got new components on his car but I didn’t… yet -- seems a bit odd that Virgin didn’t add them to both cars but whatever. An eventful initial run (fresh Primes) got P3 off to an average start, a missed apex at turn 10’s hairpin on my first flying lap of the session ruining that lap. 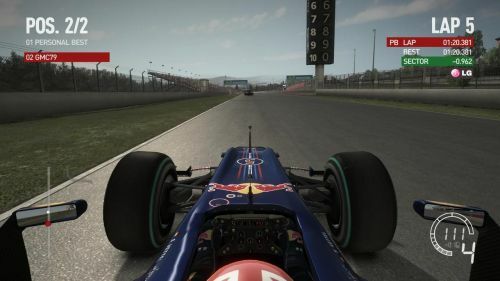 As I came back on the track Kovalainen passed me. The next lap was also crap because I caught turn 14’s curb wrong again and spun casually. Then the third, subsequent lap was aborted after arriving on an accident between Button and Kovalainen in the middle of turn’s 7 & 8. As a result, I came in early. Interestingly, the tires seemed to take a while to warm up, too -- not sure what was going on there. Run two (Primes) was also eventful, another wide turn 10 on my first flying lap as well as a half-spin off turn 2’s curb in the second, and then another wide corner at turn 7 -- which sent me into the gravel of turn 8 -- on the third lap really lowering my confidence and putting me into a bit of a mood. Once again, I came in early. Run three only exacerbated my frustrations because I was given a 5-spot grid penalty for a collision with Kovalainen as I was recovering from a very minor off on my second flying lap. I got some small wheel-spin exiting turn 12 which I had to correct and, in doing so, I reached the grass on the outside. As I came back on Kovalainen hit the back of me, hence the penalty. While yes, I was on the racing line, I was angry because he made no effort whatsoever to avoid me when he could easily see me. I don’t know if he was daydreaming or what but I get the penalty and, no matter where I qualify, lose five places. I did go on to improve my lap time on the third flying lap, but it didn’t mean much on the Prime tires. After almost switching early, I decided to stay on Primes for the fourth run and indeed, the rest of the session. This was to try and save some of the Options for Quali, as my penalty meant I needed to try and get as high as I can to ensure it doesn’t have as much of an impact on my weekend as it could have had. The run itself was fine, though when finally on course to improve my time, on my third flying lap, I went wide at turn 10 yet again and ruined it. I also went wide on the same lap in turn 13, unfortunately. Runs five and six were great, the fifth a nice and more consistent run, yielding improvement on the second lap whilst the sixth run featured a great lap on my third flyer, which elevated me to 15th. My final run was also good (all on Primes) but I didn’t improve so I came in a bit early due to the session expiring. 15th with a 1:25.276 set on Primes, my best time for the weekend (even beating my fastest time on Options). A mixed third session that had ups and downs, was hard to focus on because of my emotions in response to the penalty, and which featured an average performance all around. The track’s grip was definitely becoming better, however, and those last few runs were a joy to drive. A post-P3 interview with David Croft asked about my title hopes -- I haven’t thought about them much -- as well as how car development is going now we’re into the European rounds -- things seem to be going okay -- and whether the car’s setup suits my “distinctive” driving style -- it does, for the most part. My agent thanked me on behalf of the team for my good answers. For this session Virgin expects me to qualify 20th or better, a goal I think I’ll share after the events of the three Practices. Given my penalty, I just don’t feel like my own expectations should be too high because it seems like they would just lead to inevitable disappointment. It is, however, my first Qualifying session in wet conditions which could either work in my favour -- ala Malaysia and China -- or combine with the woes of earlier in the weekend to really lower the team’s, and my own, spirits. We’ll see how things go, though. My first attempt, on Intermediate tires given the conditions, was interesting, my first flying lap -- despite having to avoid a Lotus and its debris in turn 8 and yet another instance of me going wide in turn 10 -- taking me to the top of the time sheets but it didn’t last long as I soon dropped when the frontrunners finished their initial laps. My second lap, on the other hand, put me back to second, a position I held for a good portion of the session. My third lap saw a spin from a Force India in the background of my mirrors, somewhere in turn 9, whilst my fourth lap had to be thrown away after a shoddy exit out of turn 5. Strangely, Senna hit the back of me in turn 9 despite me moving aside, and as a result the officials awarded me another warning for the altercation even though it was clearly his fault. My second attempt had a great first lap which took me to the top of the time sheets after sitting in second for a while, but I quickly forgot about this as lap two was aborted due to Alonso coming out of the pits, and a spin off turn 7’s curb. Unfortunate timing, made worse by the damage I received by clipping the wall in the process, and the loss of time as it got repaired back in the pits. The rest of the session gone, I finished 19th as, expectedly, the frontrunners and mid-pack improved their times while I was stuck in pit lane. This put me in the elimination zone and, consequently, out in Q1, leaving the remaining two Quali sessions to be observed from the garage. Intriguingly though, some big names also didn’t make it, including Webber, Button, Rosberg and Kubica. Lucas qualified in 16th, his first time ahead of me, while my position is just one ahead of the team’s (and my own) expectations. Sebastian Vettel was also a surprise in 17th -- unusual for the Red Bulls to be so low. Massa put it on Pole with Hamilton in 2nd and Alonso following him for 3rd. My agent informed me that Virgin fully supports me, something I found pleasing but amusing given the lackluster open to the season in general. Obviously they liked seeing me on top of the time sheets, even if only briefly, and appreciate my apparent developing wet skills. She also told me that they expected 18th or better for today’s race, a goal I will once again share as I’m just not sure what to aspire to when the weekend has been so mixed. Due to my grid penalty I will actually be starting last -- instead of 19th -- but even so I’m still happy with yesterday’s qualifying performance, even if the result doesn’t reflect the positive things that can be taken from it. Besides, I’m sure Webber and the other frontrunners that had a poor session would be glad to accept the extra position. I’ll be starting the race on Options in an attempt to try and move forward quickly and I expect to be coming in for Primes on lap 23 or so, as per the team’s strategy. 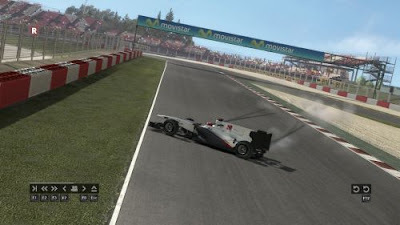 I got far too much wheel-spin at the start then almost hit one of the HRT cars who was driving diagonally to take his line, so I went off the racing line so we could get through the first corner. Webber and Senna had a get-together in turn 10’s hairpin, which elevated me to 22nd as I went past. It didn’t take long for both to catch back up and pass though, thanks in part to a wide turn 7 on lap 3 and a trip through the gravel for a bit, then again in turn 10 due to the lack of grip thanks to the rocks still on my front tires. Back in last place, I reached 22nd again on lap 7 due to a couple of retirements. On lap 9 I was lapped by the leaders (that kind of pace is insane! ), and then on lap 11 my front left tire started to feel like it was beginning to wear. Not too surprising as I had a few lockups early in the stint, too. On lap 12 the entire field -- or what felt like such, anyway -- came up behind me and I received a warning for illegal blocking despite doing my absolute best to move aside and let everyone through. This happened as we were heading into turn 10, on the back straight that precedes it. This left me feeling rather furious because I tried my hardest to move and it wasn’t my fault they were all bunched together like that -- am I supposed to crash or something in order to let the obviously quicker cars pass me by? This warning also, at the time at least, confirmed my theory that the officials didn’t like me very much. Seeing Webber amongst the pack also cemented, indirectly, what I already knew: that this race was a shocker with me just running on my own (my plan anyway) around at the back, arguably where I belong. On lap 15 I had a crap exit out of turn 16, the final turn, bouncing off the curb and into the outside gravel which spun me into the inside (pit) wall, damaging my front wing a little in the process. I continued on but lost a heap of time, Senna in 20th position coming past to overlap me on lap 17. It was around this point that I noticed the sun had come out, too, the clouds from earlier obviously disbanding and distant on the horizon. On lap 19 I had a moment in turn 4, almost spinning but I managed to save it. Lucas lapped me in turn 5 as a result of the moment, which felt absolutely horrible considering that, up until this point, I had been clearly outclassing him. In hindsight it’s quite amusing that, at the time, I wondered whether I was in a go-kart or not rather than an F1 car. The exact same moment happened again on the subsequent lap (20), in the same corner. Someone who was about to lap me clipped the back of my car and had a spin as I recovered but I didn’t see who. On the same lap in turn 9 Trulli misjudged his pass on me to lap me, also clipping me and resulting in yet another warning for yours truly (heh) even though it wasn’t my fault. Really angry by this point I was ready to give the race up, but continued on anyway. There was debris in turn 8 on lap 21 though it was unclear whose, or why. The following lap I got penalized for supposedly ignoring three blue flags in a row on the front straight. It was Senna who was supposed to pass and I did move aside but he wasn’t quick enough for some reason and, clearly, I was meant to suffer. Because people were exiting the pits I went back onto the racing line and bam, there was the penalty. I also went off at turn 1 to avoid the aforementioned exiting cars but by this point I didn’t care as I was feeling like an utter loser who didn’t belong in Formula 1. I took the drive-through penalty on lap 22, also noticing that I had reached 20th place due to Alguersuari and Trulli retiring, probably due to collisions with me. I did my scheduled pit stop on lap 23 and even stuffed that up, hitting one of my guys as I drove in. He’s okay thankfully but it meant an even slower stop than expected, already a longer one thanks to the replacement of my front wing. On lap 27 I went by Chandok who had spun in turn 14 but it didn’t matter as he had overlapped me earlier anyway. Virgin informed me over the radio that Lucas retired on lap 41, giving me 18th but I couldn’t enjoy the free position like I might have otherwise would, mostly because he was clearly the better driver out of us two this weekend, especially considering he had overlapped me. I went wide on lap 48 in turn 9 due to watching the cars coming up behind me so I could get out of the way. Another retirement on lap 51 elevated me up another position to 17th, while I reached 16th on lap 53 and 15th on lap 57, again due to retirements. Also on lap 57 I had a small spin off turn 14’s curb but it was nothing major. Petrov had a spin in turn 14 not long after lapping me on lap 58, while I finished the race on lap 59 due to being six (!) laps down. This meant that I was actually deemed a DNF -- did not finish -- but even so I get to keep my 15th placing. Perhaps surprisingly Liuzzi won the race, with Barrichello and Petrov following to round out the podium. Strange results then, but only because of some big-name retirements including Jenson Button, Robert Kubica and Nico Rosberg. That was an utterly appalling race, probably worse than my home round in Australia, and easily just as embarrassing. Despite an abysmal start and opening stint, as well as clearly being well off the pace, I maintained consistency and had a back half of the race with few minor mistakes, so that’s something to take out of an otherwise woeful weekend. It was good to finish the race too, something I’ve done in each event of the season so far while my teammate Lucas has not -- at least I have him beat there. Thanks to the many retirements I met the team’s expectations of finishing higher than 18th as well, so even though the weekend overall was horrible I can take some good points away from it -- something my agent was sure to emphasise as I returned to my truck to get ready for the next round in Monaco. Being the jewel on the F1 season calendar, I’m looking forward to it just like everyone else though after this weekend I’m not going to head into it with any silly expectations. I leave Catalunya in 21st for the driver’s standings, while Virgin remains in 12th for the constructors’. 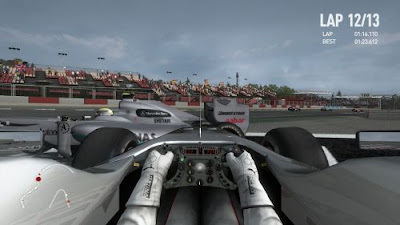 Wow at times I really felt I was reading a blog by a F1 driver than a video game player. The attention to detail that you bring to the table is just amazing. Even the social interactions you had with the NPCs felt real, nothing cheesy or forced. To be honest I passed this game up the first time around because I have never been good with simulation drivers. I usually thrive in the non real world of Blur which I thought was one of Activision's better games of last year. 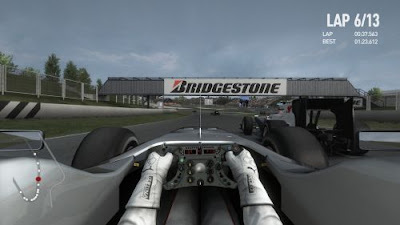 This might be the sim racer I pick up since the line between a real racer and a video game racer was hard for me to tell in this article. I think F1 racing is a lot more exciting then nascar which I don't understand that much. I tried the nascar racing sim in Gran Turismo 3 but found it hard without any of the rewards. F1 racing is difficult but seems to yield greater rewards than just racing in circles. Gaming in Public -- while I like the idea of you buying the game based on your enjoyment of my role-playing series, I must say that a lot of what gets said in it doesn't necessarily reflect the game. I have to take liberties with certain things, either because they don't exist in the game or because something happened that is inexplicable but needs to be worked into my story. As an example of this, there's no safety car in the game so big accidents are cleared instantly and I somehow have to work that into the posts whilst making it sound real -- as if it happened -- and believable. You mention my interactions with the NPCs -- there are some, my agent, engineer and the person who interviews me but the things they say are limited and as such, I sometimes add some comments from them to make the story seem more realistic. 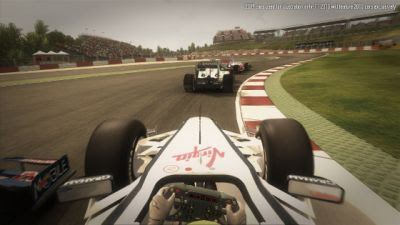 For the most part everything is genuine but, as I'm sure you'd understand, a lot of the story has to be created from my own brain because at the end of the day, F1 2010 is still structured like any other racing game: you select races via menus, race, then contend with more menus after that. It's my approach that makes this role-playing, 'pretend to be an F1 driver' series possible, not necessarily the game itself. Having said that, I'll be elaborating on my processes and how approaching the game differently has enlightened me to a few things, so keep an eye out for that post. On a side note, you mentioned Blur. I haven't played it yet unfortunately but I do own it and suspect that I'll love it, simply because Bizarre Creations made it and I'm a massive fan of them and their previous racing franchise, Project Gotham Racing. I was absolutely furious when I heard that Activision were closing/trying to sell them, and since nobody wanted to buy them it's a real shame that they have indeed been closed. It's a big loss to the industry, in my opinion. @Steven O'Dell- Thanks for your honesty on the game but it still seems like something that I will check out once the price drops. Yeah, it is a shame but as you know Activision model is to make games that can be done over and over again. I think even if Blur did sell more it doesn't really fit the business model of the company. If you go to Amazon you can get it for about $24.99 brand new for 360. Gaming in Public -- Yeah, when it was announced that Activision were buying Bizarre I thought it was a little... well, bizarre (sorry couldn't resist). I mean, maybe an arcade racing franchise goes nicely alongside Guitar Hero and Tony Hawk, but then, the games Bizarre make (or did as the case may be now) were never traditional arcade racers, so it was a bit odd. Speaking of Guitar Hero, I find it interesting that it has been discontinued given our recent discussion, particularly on Activision's profit-focused mentality. Perhaps they're restructuring and trying to do what EA did in 2006-2008?